Do you remember Reagan’s spaced-based “Strategic Defense Initiative”, known derisively as “Star Wars”? It was never built because it was costly, provocative and consistently unreliable. Since then, however, each successive administration has continued to lavish vast resources on it, with the total costs over $180 billion so far. Any normal person could ask why, and the truth comes down to this: the defense industry, knowing a cash cow, has never relinquished its hold on elected politicians. 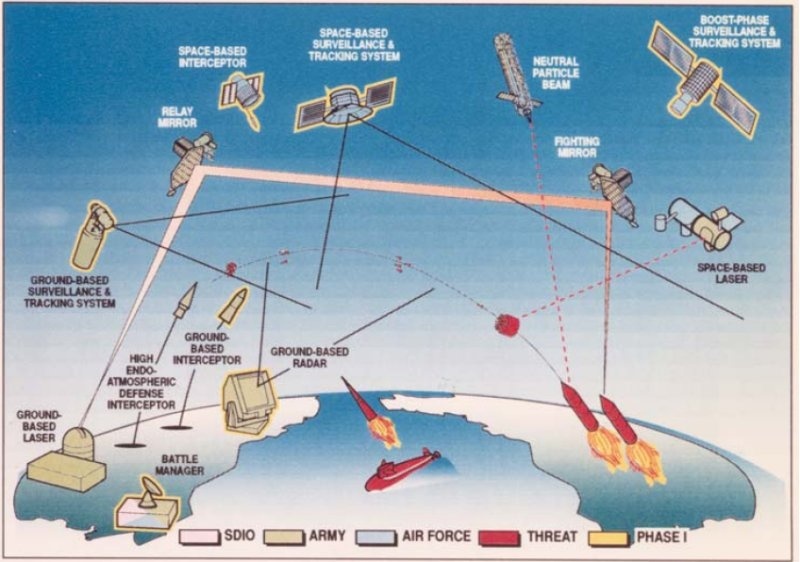 And this: despite the fact that even the newest version of the program has less than a 50% success rate under even the simplest of scenarios, the generals have always coveted a workable missile defense system that could be an indispensible part of a first-strike threat against either Russia or China. They have always known that, rather than protecting America from some mythical, unprovoked attack, the system would actually be insurance against retaliation by anyone the U.S. might choose to attack first. For this reason, the Obama administration expanded the program. Future historians will ask why George W. Bush sought and received express congressional authorization for his wars…and his successor did not. They will puzzle over how Barack Obama the prudent war-powers constitutionalist transformed into a matchless war-powers unilateralist…Although he backed down from his threat to invade Syria last summer, President Obama proclaimed then the power to use unilateral force for purely humanitarian ends without congressional or United Nations or NATO support. For the past eight years, critics of Obama’s secret assassination programs and mass surveillance operations have made two critical points. The first is that…these kinds of broad authorities invite abuse, mistakes and errors, even if those calling the shots are operating in good faith. But the second point, now made painfully relevant, is that someday you might not trust the people calling the shots. You might realize, instead, that they are terrifying. That day has come. Now, in these last weeks of (Obama’s) presidency, his administration has given JSOC new powers to “track, plan, and potentially launch attacks on terrorist cells around the globe” and to do so “outside conventional conflict zones” and via “a new multiagency intelligence and action force.” As a result, whatever this new task force may do, it won’t, as in the past, have to deal with regional military commands and their commanders at all. Its only responsibility will be to the U.S. Special Operations Command (SOCOM) and assumedly the White House. Obama stood on the high ground of moral righteousness, publicly weeping as he decried gun violence in America. But behind the sanctimonious finger-pointing, he discreetly brokered and authorized the sale of more arms to foreign governments than any president since World War II. 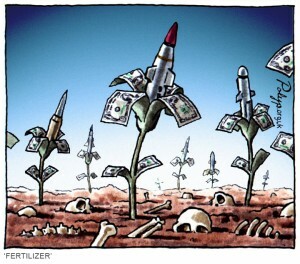 Arms exports totaled over $200 billion, exceeding the amount Bush had approved by $60 billion. Over half of that amount went to the Saudis. Cui bono? The U.S. did temporarily ban some of the worst human rights offenders from these weapon deals. H owever, when Saudi Arabia, Algeria, Kuwait, the United Arab Republics and Qatar “donated” to Secretary of State Hillary Clinton’s foundation, she waived those restrictions. In April 2009 Obama pledged himself to make “the world free from nuclear weapons.” Six months later, despite having escalated the war in Afghanistan, he received the Nobel Peace Prize. In a bizarre twist on the “Watch what we do, not what we say” theme, the Nobel Committee cheapened itself by rewarding someone for things he said he might do, rather than for actually doing any of them. But even in his acceptance speech, Obama could not resist defending American militarism. The truth became clear soon enough, as he announced plans to build redesigned nuclear warheads (smaller and thus much more likely to be used), new bombers, submarines, land-based missiles, weapons labs and production plants. Under Obama nuke spending rose higher than under any other president. The cost over thirty years would exceed $1 trillion and violate the 1968 nuclear Non-Proliferation Treaty. Indeed, he reduced the nuclear arsenal far less – about 5 % – than any of his three immediate predecessors had. In 2015 his belligerent and costly policies led a member of the Nobel Committee to openly regret awarding him the Peace Prize. Two weeks before leaving office, and with the obviously unstable Trump arriving, Obama still ignored requests to take the nuclear attack program off its provocative and dangerous “hair-trigger alert” status. Obama’s final year was a festival of self-congratulation for the waste and corruption that took place on his watch. In May he presented the Distinguished Public Service Award to the war criminal Henry Kissinger. …the Pentagon has been at this dodgy game for decades. In 1996, Congress passed a law requiring all federal agencies to comply with federal accounting standards, to produce budgets that are auditable and to submit an audit each year…two decades later, the Pentagon has yet to comply…the only federal agency that is not complying or, the IG’s report suggests, even trying to comply. …if the charge is that the Russians influenced the outcome of the 2016 presidential election, then either they did or they didn’t. If they didn’t, they aren’t very good hackers and might have been safely ignored. If they did, then why no demand that the results of the election be set aside and new elections held? Why are no specific effects of the Russian hacking demonstrated? Meanwhile, as I mentioned above, Obama signed into law the Defense Authorization Act that further strengthened the repressive capacities of the state. He could have closed the Guantanamo prison by executive order but didn’t. And he quietly ensured that the Senate’s investigation into the CIA’s use of torture after 9/11 would remain classified for at least another 12 years. No one would be prosecuted for torture (or for causing the financial collapse), and none of Trump’s thugs need worry about future war crimes.